The Queen’s Regiment of Horse breaking through on the right flank; seen here capturing the kettle-drummer of the Bavarian Electoral Guards. 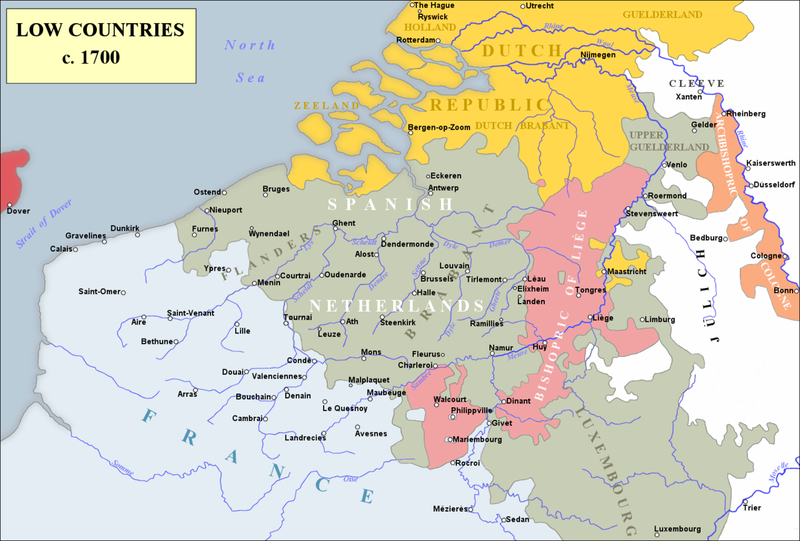 Map of the Low Countries during the War of the Spanish Succession. The village of Ramillies lies near the Mehaigne, a tributary of the Meuse. The Battle of Ramillies was an important allied victory against the French during the War of the Spanish Succession (1701–1714) and a personal triumph for the principal allied general, John Churchill, First Duke of Marlborough. 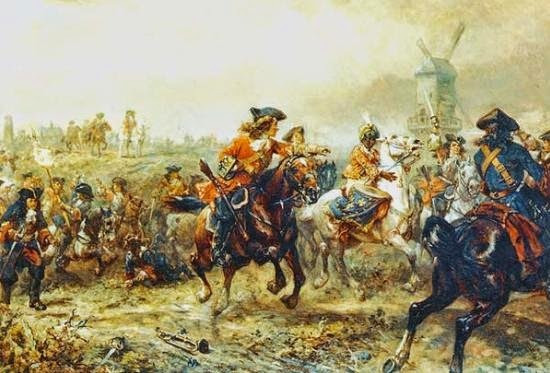 Following the splendid allied victory at Blenheim in August 1704, a stalemate developed in the Spanish Netherlands (present-day Belgium), where Marlborough saw his desire for offensive operations frustrated by caution on the part of the Dutch. Operations along the Rhine and in northern Italy were inconclusive. This situation prevailed throughout 1705. In May 1706 French marshal François de Neufville, Duc de Villeroi, believing that Marlborough intended to seize Namur in the province of Brabant in the Spanish Netherlands, moved there with about 60,000 men. Villeroi’s army was intercepted north of Namur at Ramillies by Marlborough’s allied force of about 62,000 British, Dutch, and Danish troops. The French took up position on high ground and partially entrenched, their center on Ramillies. The French position, however, was dangerously overextended. The battle occurred on May 23, 1706. Marlborough feinted an attack on the French left. To meet this threat, Villeroi shifted his reserves and pulled some units from his right wing, whereupon Marlborough launched his main attack on that weakened sector. Although the French soldiers on the right flank fought well, the men were simply outnumbered and overwhelmed. Sensing that the entire French line was near collapse, Marlborough ordered a general advance, aided by the aggressive action of the Danish cavalry. The French fled in disorder. Marlborough ordered a vigorous pursuit, and indeed his forces inflicted most of the casualties in this phase of the battle. The pursuit ended some 20 miles from Louvain. Total French casualties amounted to some 13,000 killed or wounded and 6,000 captured. Allied losses were only 1,066 dead and 3,633 wounded. 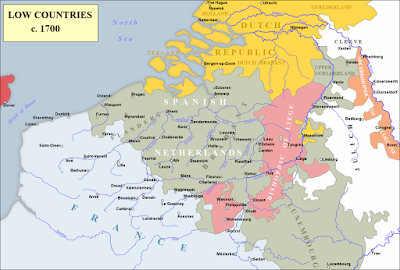 The Battle of Ramillies had significant consequences, allowing the allied forces to overrun the Spanish Netherlands. During June–October, Marlborough took a dozen important fortresses in the Netherlands and north-eastern France, including Antwerp, Dunkirk (Dunkerque), Menin, Dendermonde, and Ath. The allies also captured an additional 14,000 prisoners. In August, King Louis XIV ordered Marshal Louis Josef, Duc de Vendôme, north from Italy to replace Villeroi and also put out tentative peace feelers. References: Chandler, David G. Marlborough as Military Commander. London: Batsford, 1973. Churchill, Winston S. Marlborough: His Life and Times, Vol. 2. London: Harrap, 1934. Hugill, J. A. C. No Peace without Spain. Oxford, UK: Kensal, 1991. Jones, J. R. Marlborough. New York: Cambridge University Press, 1993.